Daily Illuminator: Who Says You Can't Take It With You To Heaven? January 9, 2012: Who Says You Can't Take It With You To Heaven? January is a time to reflect about all the new goodies you've received . . . as well as those you want. 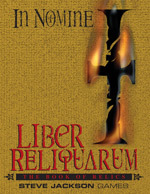 Give in to angelic contemplation or demonic greed, with In Nomine: Liber Reliquarum. Freshly available at e23, this classic release comes packed with amazing artifacts -- and the digital delights herein won't clutter up your Celestial closets or Ethereal attics! This tome also includes rules for making your own artifacts; you can use the items here as divine (or infernal) inspiration to devise exactly what you want. Finally, it comes with two adventure possibilities ready to stir up the waters between angels and demons, plus four fully-statted artificers waiting to be left to their own devices. Regardless of which front you're fighting the War on (or if you're just looking for an eldritch edge to keep you out of danger), In Nomine: Liber Reliquarum has the artifacts you need to succeed. Be equipped for anything!